Today is National Gossip Girl Day! For real, it's a thing. 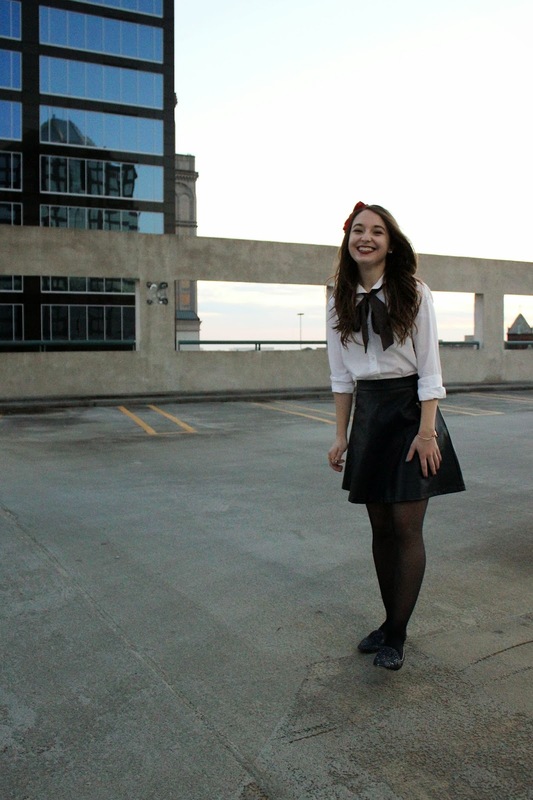 So I'm celebrating my favorite show by taking part in the Gossip Girl Link Up hosted by Michaela, Carrie, and Courtney! To view the other bloggers participating in this link up, just check out any of their posts and it's linked at the end! 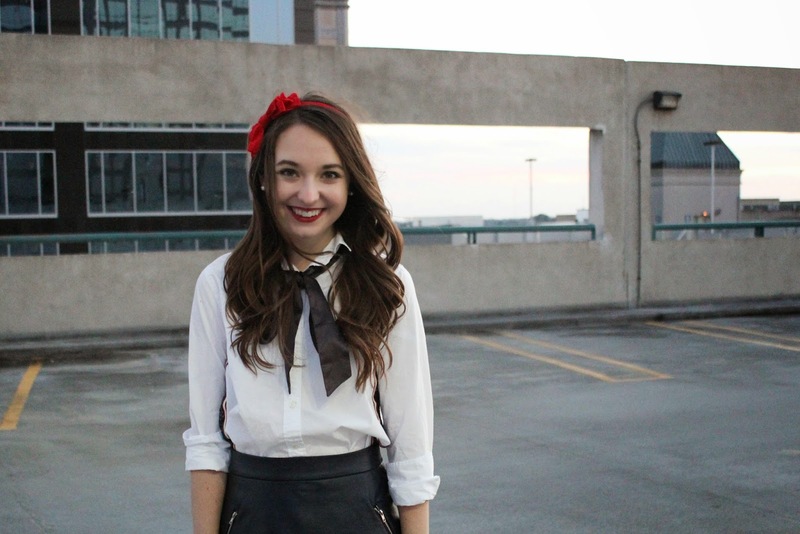 Blair Waldorf has always been a huge style inspiration for me, so of course that's the GG lady I chose to dress as for this post! I took these photos with Annaliese and Gina during our NC Her Campus Blogger meet up that I posted about last week! Shirt: J. 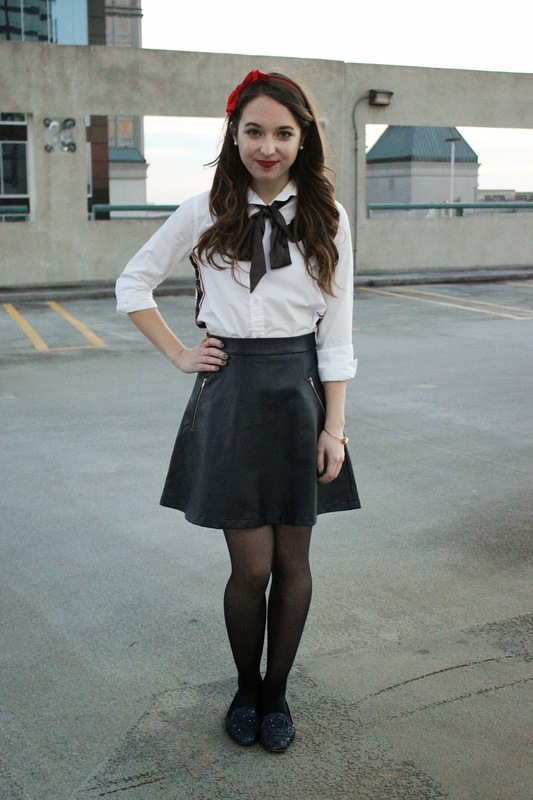 Crew, Skirt: Tinley Road (navy sold out, available in gray, white and black), Tights: J. Crew (old), Shoes: J. Crew, Bow: used to be on a Gap sweater I had in high school, Headband: J. Crew (old) 1. Who is your outfit inspired by and why did you pick them? 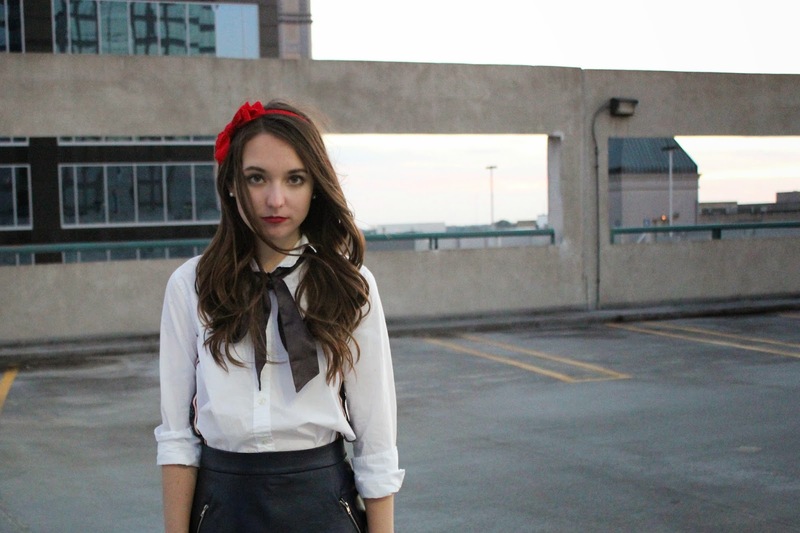 Blair, because I've basically been attempting to look like her since high school. Although her personality is not the most admirable, she just always looked amazing! 2. Favorite Gossip Girl moment? Easily the end of the season 2 finale (*spoiler alert for those of those you watching on Netflix from the beginning*) when Chuck finally tells Blair he loves her! Cara you look so adorable! Love your Blair look! Thanks for participating - my post is now live and you can linkup whenever! Thanks Michaela! I loved your look as well, thanks for hosting this!! Loving this look!!!!!!!!! Definitely so blair - right down to the shoes and of course the headband. 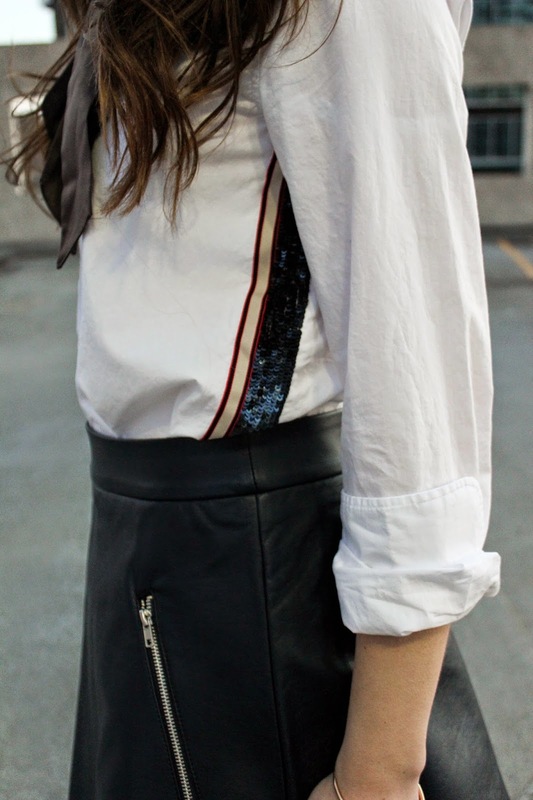 I need a leather skirt like that in my life! 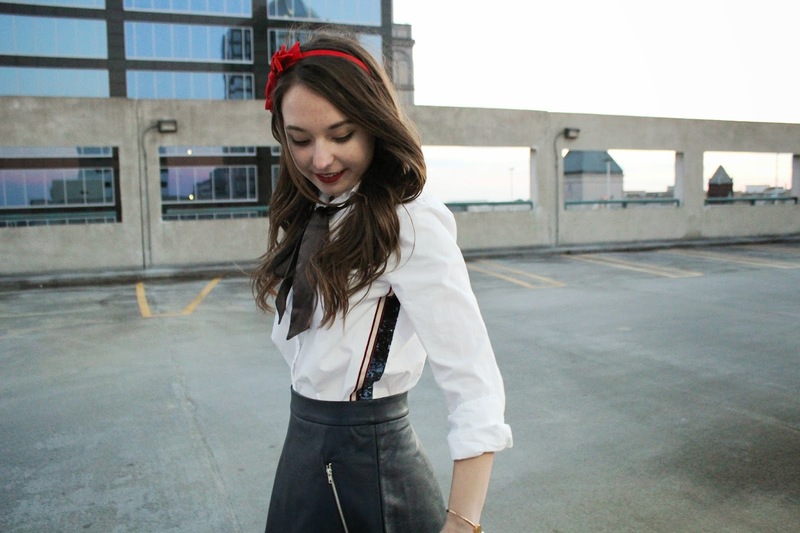 Oh my goodness I absolutely love that skirt! I love all of your posts Cara, so I nominated you for the versatile blogger award, which you can find at hyperactive daydream . I love love love love LOVE your take on Blair. Its Blair with a little bit of edge! Fabulous! You are so cute! I love this look. Yay for Gossip Girl Day! Yay!! This was so much fun to do! I'm so glad we were able to do all of these together and have a fun day! Definitely one of my favorite Blair outfits so far! SO cute! Loving your outfit! And your hair is perfect.. I think Blair would have been proud of this outfit! I love it! 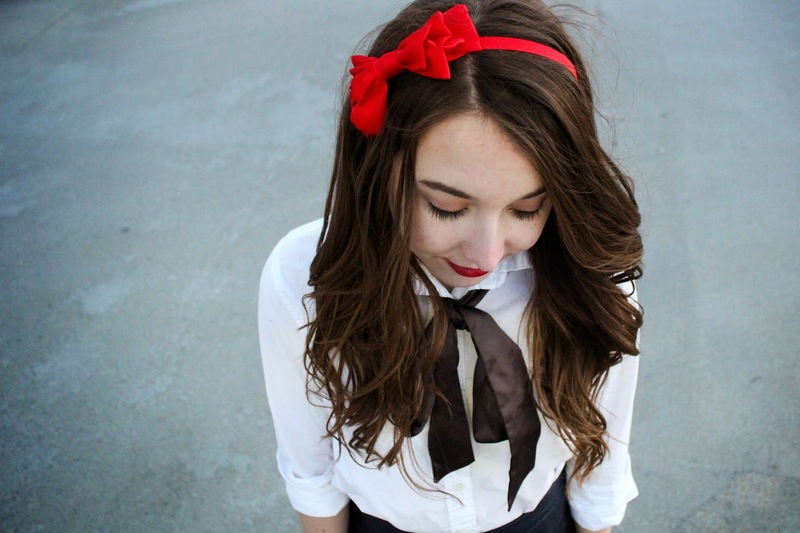 Its perfect from the headband to the tights! :) And I agree, I LOVE that moment. Chuck and Blair forever!